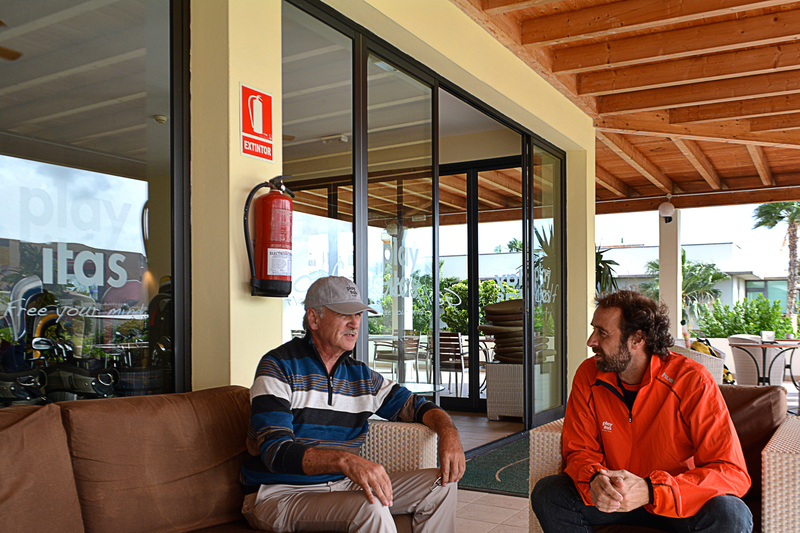 Last week we were ‘honoured’ to host our golf course architect and a true ‘gentleman of the links’ Mr John Chilver-Stainer at Playitas Resort and we caught up with him for a chat and a coffee! We know you designed Playitas Golf but are you also a golfer? I’ve played golf since I was a child growing up in Scotland. I began playing with the hickory clubs of my great grandfather, captain of Cowal G.C in 1892. I still play regularly and particularly enjoy playing the classic links golf courses of Scotland. When did you first visit Playitas and how was your first impression? In 2003 I was asked to visit Playitas to make a preliminary project. The original concept was to create an 18-Hole Par 72 up the valley above the road and have a practise facility on the sea side of the main road. I was quite excited, as the land to the top of the valley would have provided a magnificent golf course. The elevated topography, rocky outcrops, the natural barancas, the old walls, the wind mills, natural grass land, scrub growth and rich brown stony landscape was captivating. The strong blues of the sky and sea viewed from the course with the rising sun made a fantastic contrast with the brown ochre and terra cotta colours of the hills. Are you satisfied with how the course has turned out? Although the project had to be reduced in size I am very pleased how the golf course turned out. The holes below the road with the water hazard and stream, integrated into the garden style of the Hotel Resort are visually dramatic. The baranca makes the Par 3’s demanding to play. The holes above the road were conceived to integrate the natural environment of the surrounding landscape. The golf course constructor Shaper Golf under the management of Braulio Uribe took great care not to damage the surrounding natural areas and enhanced the barancas with carefully chosen rocks. Their modelling of the fairways and greens followed my conceptual planning to perfection. I am also very pleased with the choice of the paspalum grass for the fairways recommended by the agronomist Braulio Uribe, which can be maintained to allow the ball to run similar to the Links golf courses of Scotland. Have you designed other golf courses and where? Most of my golf courses have been constructed in Switzerland where I am resident. However I also have a golf course in Scotland near Edinburgh and another I helped with in the highlands of Scotland. 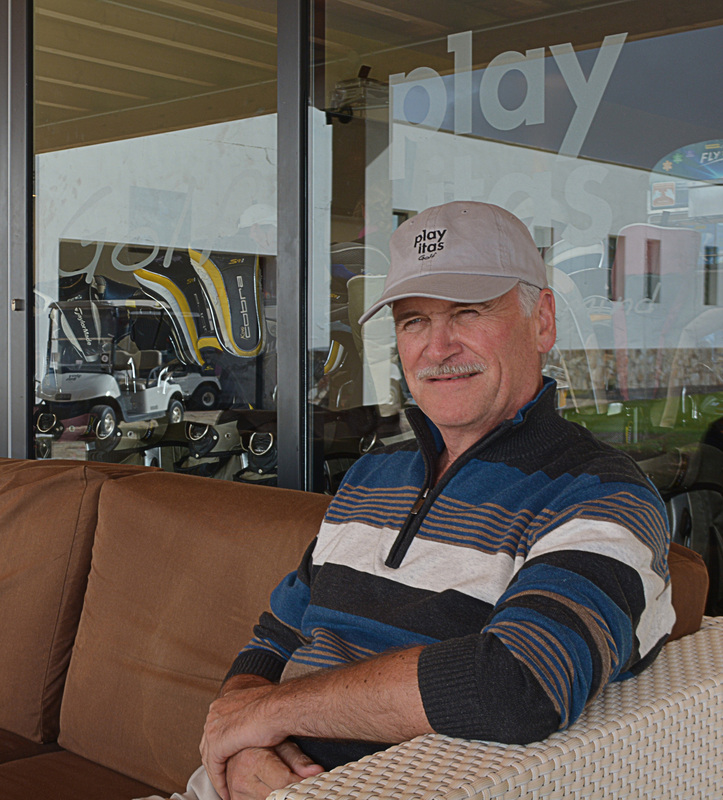 What makes Playitas Golf special or different for other golf courses? Playitas is very much it’s own golf course. There is nothing quite like it. It is this uniqueness that makes it special and different from other golf courses. The unusual routing runs up and down the valleys between the imposing stony cliffs and hills and over the barancas. Natural coarse grasses, scrub and plant life are allowed to blend in with the sides of the golf course without any foreign plants or the clichéd Palm Trees often used on other golf courses. Garden plants and Palm trees are only placed on the golf course near the Hotel Resort. The natural barancas at the bottom of the valleys tie the golf course together and are fully integrated into the shot playing. 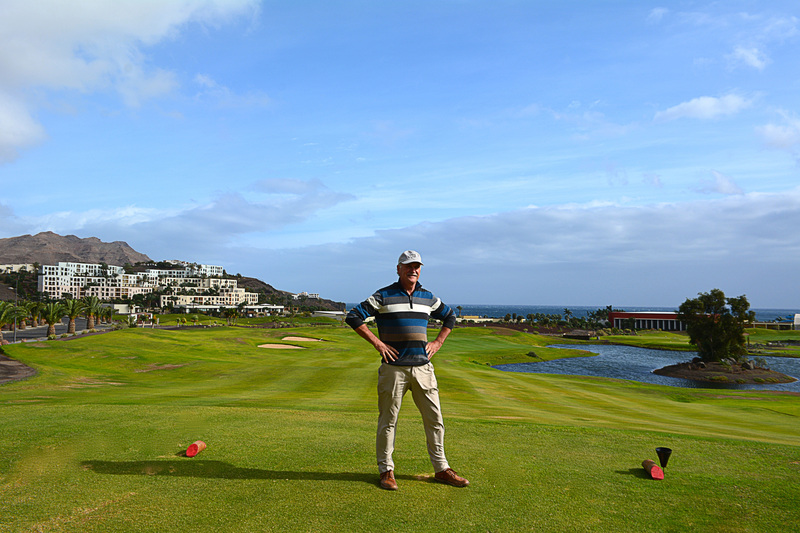 Unusual for the Canary Islands is an 18-Hole Golf Course with a Par of 67. Like other golf courses in Scotland with a Par of 67 it puts more emphasis on the Par 3’s, which are often more demaning than Par 4’s and 5’s. The course has 3x Par 5s, 7x Par 4’s and 8x Par 3’s which calls for all the clubs in the bag. In the end it is not just the Par that defines the quality of a golf course but many other parameters. A golf course can only be special when it has variety and a certain originality of it’s own. What’s your favourite golf course in the world? It’s not easy to name just one as each have their individual special qualities. However the course I enjoy playing the most is The Old Course, St. Andrews, Scotland. They’ve told me that you have a bit of a “cult following” culture to your golf courses. Is this true? And why are your designs different? Apparently there is a cult following as I have many fans of my courses. I believe the difference my golf courses have to other designs is the natural bonding of the golf course to the unique surroundings of each individual site and environment. The searching and discovering for this natural bond leads to an interesting and authentic variety of holes and in turn avoids any repetitive clichés and formulaic golf design. The variety will present the golfers with some unusual shot-making and offer them a choice to make a strategy to play the hole. The greatest difference of my golf courses though, are the Greens and surrounds which have multiple complex slopes shaped organically to appear like natural undulations. On these greens the golfer will have a different variety of chips, pitches and putts with each round he plays. At present I have 4 projects in the planning phase in Switzerland and which I hope will be realised in the near future. What kind of play would be most suited to play Playitas Golf? Playitas golf course is a very attractive golf course but requires more than just basic skills to enjoy playing it. There are many side slopes, forced carries and running fairways and of course the wind. Playitas is therefore ideal for players advancing from the beginner stage to an intermediate stage where they will have the opportunity to learn and practise many of the shots required in the repertoire of an accomplished golfer. With the great practise facilities it is an ideal place to improve and enhance their game and get expert advice from our Scottish head pro Murdo McCorquodale. Good golfers will find that Playitas, in spite of the Par 67, has a variety of interesting holes to test all the clubs in the bag. I hope many golfers enjoy their golf at Playitas and continue their never ending struggle to catch the next birdie. This entry was posted in Golf, Interview - Entrevista and tagged Architect, Golf, John Chilver-Stainer, Playitas Golf, playitas resort, Scottland. Bookmark the permalink.